Herding Cats - get it here! 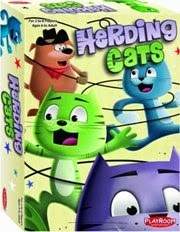 Being a cat-lover, I was excited when Playroom Entertainment sent me a copy of "Herding Cats" for review. 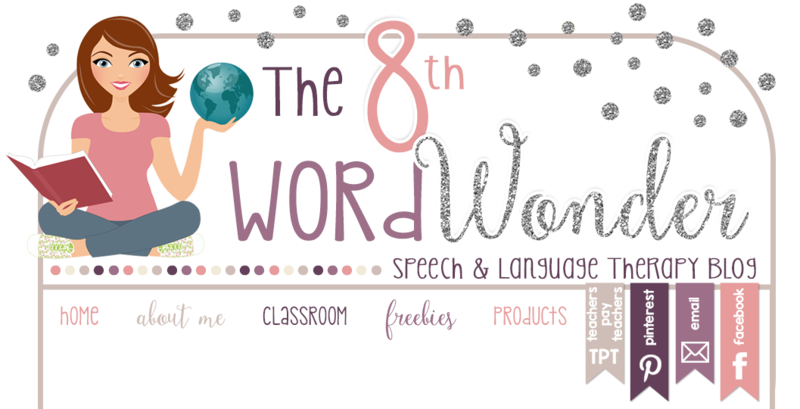 This card game can be played with 2 to 6 players aged 6 and up. The object of the game is to create a herd by matching three Cat cards to a same-colored Cowdog card. The player who has collected the most herds after the draw pile runs out is the winner. To play, all of the cards are shuffled and placed on the table. Each player starts out with three cards. On their turn, a player must play a card (if they can't, they place a card onto the discard pile). At the end of their turn, players draw a card to ensure they always have at least three in their hand. If a player has a Cowdog card, it can be placed on the table. 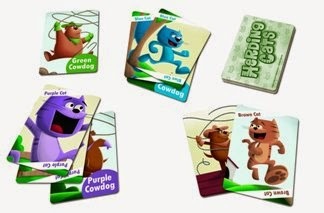 Players then try to match same colored cats to the Cowdog card until there are at least three cats, at which point the player gets to keep the pile. The player with the most cards at the end wins. There are also special cards: "Stampede" cards allow a player to search through the discard pile and remove all of the cats that can be immediately played on any Cowdogs that are currently on the table. And "Wild Cat Lady" cards substitute a cat of any color. This game is great for articulation / drill & kill therapy because gameplay is easy to learn and turns are fast. It would also be an great activity while working on the /k/ sound ("cat, "cowdog", "catch"). The cards are slightly thicker than regular playing cards, aiding in durability, and the illustrations are pretty cute. This is definitely another great addition to the games shelf at work!